The kids and I were playing with the Google translator again. We take some text from a well known story, nursery rhyme or song, paste it into the translator, and send it on a journey through the languages. Converting from English to another language and back again. You all should be familiar with "Green Eggs And Ham". Would you eat them in a box? Would you like them at home? Do you have any mice? I do not like them at home. I do not want to be a fugitive. I do not want here or there. I do not like them anywhere. I do not like green eggs and important. I do not like them Sam I /. Did you find it in a box? Did you find it Fox? Not in the framework. Not with Fox. Not in the house. Not with the mouse. Will not find them here or there. I will not find it anywhere. Will not eat green eggs and important. I do not like them Sam I /. You, which they are afraid in the house? You, which they are afraid with the rat? I do not taste D in the house. I do not taste D with the rat. I do not taste D here or there. I do not taste D in each possible place. I not taste of the eggs and Grüns of the ham. I do not taste D, am. You eats it in the box? You eats it with the fox? Not into up fan genes. Not with the fox. Not in the house. Not with a rat. I would eat it not here or there. I would not eat it in any place. I do not eat eggs and the green ham. I do not taste D, am. They are men you owe it to the lower genital house? They are men you owe it to the lower genital, like rats? I do not like their home. I do not like their mouse. I still do not like this place for them. I am not happy like their premises. I do not like green eggs and ham. Sam B which I am, He does not like it. You eat things were box? You eat stuff. fox? This is not a box. It is not a fox. This is not a house. It was not rats. I told them this place or not eat. I will not eat it. I will not eat green eggs and ham. Sam B which I am, he does not like. "Munchos are a Frito-Lay brand potatocrisp snack. Munchos are thinner than most potato chips, to the point of being slightly transparent. Their slightly curved shape and rough texture assist with dipping." Dipping? Dipping! Are you kidding?!?! I don't think that you could dip a Muncho in anything with a thicker texture than water. Although I haven't actually compared the two, I think the tensile and compressive stress rating of a Pringle is higher. Back around New Years, Amy, Alec, and I were out exploring the area. It seems that everywhere we go we run into JFK Boulevard. Amy asked, "Just how far does this road go?" We decided to find out. Well, It goes farther than I expected. It ends at the water, under the Bayonne Bridge. We also found the Bayonne Light Rail stations, and some shopping centers. While driving up and back down route 440 we noticed a sign for the Bayonne Cruise Ship Terminal. Since we all had our cameras on us, it was suggested that we drive in to see if there were any ships to take pictures of. A short distance in, we came to a military-looking gatehouse. The guard motioned us to a stop and asked where we were heading. I told him we were just curious and exploring. He said that there weren't and ships in port that day, but there was an interesting 911 monument down on the river. He told us to just follow the road and we couldn't miss it. I wasn't expecting much, but curiosity prevailed. We drove through what appeared to be an old military base, winding along a pathway defined by barriers and cones. At the end was a parking lot, and a small park surrounding a surprisingly large monument. It had a solitary message that had an effect on all three of us. 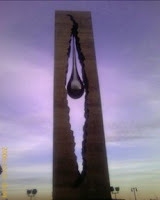 A large teardrop embedded in a fractured tower. We stayed as long as we could tolerate the cold wind that had kicked up. Here is a picture I snapped with my phone. It really doesn't show the sheer size of it. This site lists it at 100 feet, and gives some history of this gift from Russia. Please go check it out if you get a chance. I know it's been a long time since I posted. I am so sorry. I see things every day that I want to write about so I have no excuse. Today I ran into one that I just had to share with everyone. Please note: E-mail must not be used to report gas odors. Please use our gas odor toll free number listed above. You know, it's not the stupidity of the statement that got to me, but the fact that they HAD TO PUT IT THERE!! This means of course that someone TRIED IT! I'll have to check the FDNY site for a similar message. Can you imagine? "Dear sirs, My dining room is on fire. Please send help and marshmallows immediately."